Welcome to today’s guide on how to cook quinoa by Luna. Truth to tell, I was actually kind of inquisitive. You know. It’s not so rare to come by a saying elsewhere stating about the toothsome texture of quinoa. That’s just the rationale for me to grab a quinoa batch right here. So, handle me folks. That’s alright, because quinoa is seriously good. 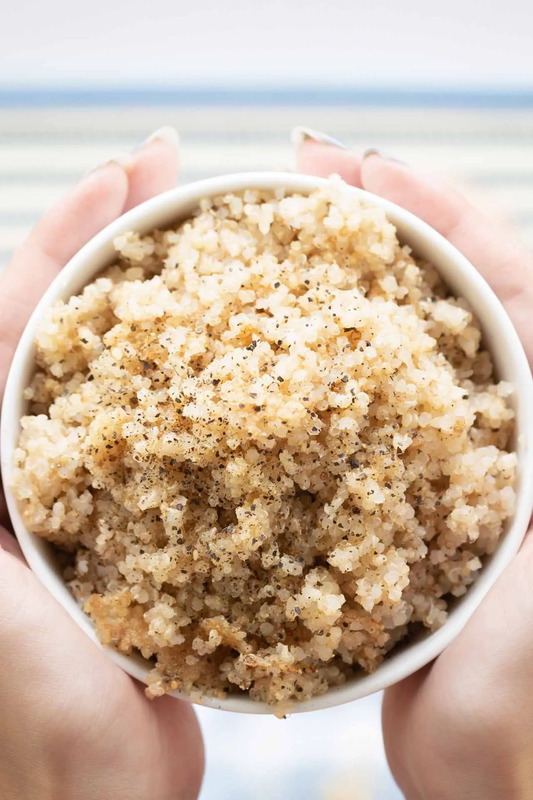 If you’re in the exact situation where bland white grains just happened to stultify you for, I don’t know, maybe since a bestie of yours started to go nuts over it – then you might want to give quinoa a chance. Quinoa may sound exotic to some people, but it’s just plain truth that the seed was actually found 5,000 years ago. Coming out as tiny pearls once cooked, quinoa is pretty oat-like with a-bit-gluey endosperm (which is unique and unexpectable source of phosphorus, iron and riboflavin) to surround. Quinoa is super versatile just like how other popular whole-grains have been. Not only white rice – you would probably crave for quinoa subdueing even oatmeals and brown rice. Though being pretty much similar in calories intake, the amount of fiber, minerals and protein to go alongside in quinoa is just heaven, compared to white rice. Especially with an ideal protein-to-carb ratio, quinoa is no doubt among the best picks for diabetics and those who crave for long-term health improvement. Besides being multiple times more nutritious yet leaner and gluten-free, quinoa is also favored for its naturally earthy taste. Tap into quinoa’s benefits to see how this amazing seed can overpower plain white rice, shall we? It is said that about 10% of a single amount of quinoa is fiber, which makes it to the top grains with highest fiber content. Not only providing fewer calories while filling you up faster and longer, fiber is also super beneficial for weight-loss schemes. It helps lower your body’s glucose level and prevent risks of diabetes or heart diseases. To be acknowledged as a “complete protein source”, one must contain all the essential types of amino acids. Surprisingly, quinoa is one of those scarce, natural resources with all nine types, even including lysine. It’s mainly because of lysine’s important role in tissue growth and repair, as well as proper development maintenance that makes it a supportive remedy. However, our bodies themselves can not produce lysine, and diet is the only way to get them. Science has stated how vegans and vegetarians usually have to suffer from lysine deficiency since lysine is mostly found in meat and fish. So apparently, quinoa coming to the game just makes up a perfect link to equilibrate the lack. Quinoa, as a grain food, is not as similar as some sugar-coated cereals, rice crisps or plain white bagel which spikes your blood sugar level rapidly. Quinoa has been widely considered a good choice for weight-loss diets and an obesity preventive due to its low glycemic index of 53. Antioxidants are beneficial substances which attribute to radical neutralization and aging deceleration. Being a whole-grain food as quinoa is, it’s no surprise that a large amount of antioxidants is found in this healthy carb source. Minerals such as magnesium, potassium, zinc or iron are all essential substances to human’s body. Unfortunately, they’re also among the nutrients that people tend to be lacking in the most, since it’s hard to meet our needs just by daily dieting. Luckily, quinoa is proved to be remarkably high in all of these 4 substances. The grain having about 30% magnesium, 10% potassium, 20% zinc and 36% iron of the RDA has properly said it all. Its benefits to metabolic health as well as wounds healing and red blood cells recreating are undeniable. Woo, here we are, shouting out to people who don’t know how to cook quinoa just yet. Case in point: For those who are not so proficient within the kitchen space, a random quinoa spin-off can alwaysl bridge the gaps for you. Casseroles, desserts, or even quinoa smoothies are in for amazement. Give yourself some space and conquer your stretch of imagination folks! Haha, that’s very funny. Yeah. No. Of course it’s a no. I’m not here to just cook and leave, I’m here to have your back. Have I mentioned the suppleness of quinoa just yet? Cooked or uncooked, chances for surprising offsprings from quinoa are endless. If you can’t stand being unsophisticated, just throw a brief-processed quinoa salad bowl topping with some finely sliced boiled eggs, accompanied with a tasty quinoa smoothie. Don’t forget to give it a final proper entreé with a sumptuous fried quinoa dish. You know what they say, your creativity can just happen to be an unique victuals inadvertently. Who knows. Well I presume these pieces of my intimation might (hopefully) be salutary for those who are in hard-pressed. Now the rest is all up to you. I have always really liked quinoa, and it’s been a great food for my gluten-free son. 🙂 I love seeing those crispy bits of it in that bowl. YUM! We absolutely love quinoa…okay, my pickiest eater doesn’t…but we are still trying to get her to try it. I love your step by step instructions, you make it look so easy!